There are times when the path in front of us looks daunting because of the resistance we face. When you’re choosing to step out of the bunkers of your own point of view, two realities can adjust your vision to see the path as more inviting than daunting. The first is choosing not to choose. The second is choosing both good things. Staying out of bunkers means jumping into a radical way of life. It may feel like you’re crawling through mud at times, but the journey is worth it. Let’s look at two important pieces to keep in mind before we go forward. The first radical way to walk out of bunkers and toward freedom is to choose not to take a side. It sounds simple when I say it like that, but it’s anything but simple. This place in the middle, this decision to walk in truth without choosing a bunker, is what we’ll call no man’s land. 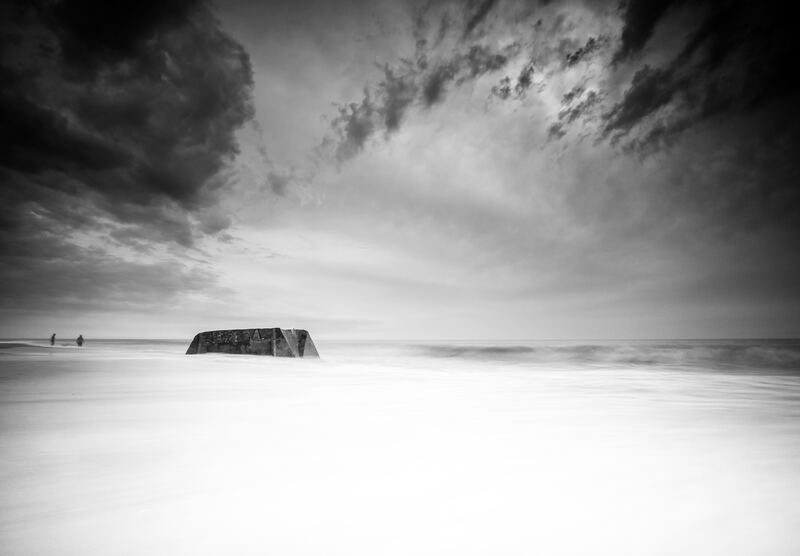 On the battlefield, no man’s land is the exposed area between two bunkers. It offers neither concealment nor protection. Soldiers ordered to charge onto it know death is likely. Soldiers wounded there may wait days for rescue. No man’s land is the last place in the world a soldier wants to be. [i]Yet, in everyday life, humble pioneers call no man’s land home. The late Reverend E. V. Hill once found himself in no man’s land. [ii] He once spoke about a time when he received death threats from both the Ku Klux Klan and the Black Panthers, two opposing groups, both entrenched. Hill was working with Martin Luther King Jr. to promote civil rights and racial reconciliation. Like King, he refused to lock arms with anyone favoring violence. He chose to walk the middle way, and in doing so, he made enemies. But making people happy wasn’t his goal. Reconciliation, justice, and hope was his goal. Hill chose to live in no man’s land, dangerous as it was. When people want us to choose sides, the pressure gets intense. They’re not politely asking. If we decline their offer, they’ll take it as a personal rejection. Do I side with them and thus reject someone else? Or do I refuse them, leaving them feeling rejected (and apt to reject me)? The second radical way to walk toward freedom is to pursue two biblical principles at the same time, even when they appear—at first blush—to contradict each other. If you want to live in no man’s land, you must never pursue one principle at the expense of another. In each case, they must work together. This dance proves to be more difficult than you might imagine. Here’s an example. The Bible instructs parents to be kind to their children. God desires for parents to give their children a glimpse of his extravagant kindness. The Bible also instructs parents to discipline their children and to not spoil them. God knew that parents would be prone to swoop in and rescue their kids at every first sign of trouble, preventing their children from learning responsibility. So should parents choose kindness or discipline? Of course, the answer is both. Beth and I hate getting a call from our children’s school. We love the school, but we know that the call might be one of our kids. They might tell us they aren’t feeling well, but they are probably telling us that they forgot their lunch. So we have a choice to make: kindness or discipline? Will I drop everything in my busy day to bring them lunch, or will I say, “(1) Where is the emergency five dollars you’re supposed to keep hidden in your locker for such a time as this? (2) This has happened before and your friends shared their extra food with you, so start begging them. (3) I bet you’ll remember your lunch tomorrow. (4) You’ll thank me some day. (5) Love you!” (That last one spoken in an overly happy voice, of course). I’ve chosen both options with my kids. If I knew my son probably forgot his lunch because he was having a tough week, or because he was busy helping his little sister carry her science project to the car, I’d drop everything and take him lunch. But if he’d forgotten his lunch multiple times that month, he’d better hope his friends don’t eat the crust of their sandwich. With my children, when I lean toward kindness, I hope I still value discipline. And when I lean toward discipline, I hope I do so with kindness. God wants me to pursue both, and sometimes that feels like a dance. God never contradicts himself. Instead, he balances us. We’re tempted to choose one worthy pursuit at the expense of others, but God invites us to choose both. He invites us to choose swampy trails over concrete walls, nuanced convictions over dogmatic extremes. He invites us to say yes to all good things, never pitting one against the other. Imagine, if when my son forgot his lunch, I chose kindness. 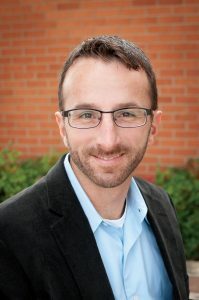 And imagine when I pulled into the school parking lot, lunch in hand, a crowd of angry protestors greeted me, waving signs with “Quit spoiling your children,” or “Proverbs 29:17” written on them. And then imagine that a counterprotest showed up, chanting, “Parents who say no, to hell they go!” What would I do? What if I don’t like either extreme? I hope I’d find the courage to walk between the two groups. If they started throwing things at me, I’d duck, swoop, and swerve. If you saw me from a distance, you might think I was dancing, but I might only be dodging. You’ve never seen a riot caused by your son forgetting his lunch, but I bet you’ve felt the fear of being surrounded by warring opponents. Perhaps you’ve dodged accusations from one side that you don’t care enough for a needy friend, and from the other that you’re unwisely giving too much money away. When those accusations come at the same time, space between can feel pretty lonely. It feels like a no man’s land. Dwelling in no man’s land necessitates the shedding of comfort, pride, and habit. Something will get slaughtered in our travels: either our adversaries or our pride. Which of the two will you let die? Despite the coming onslaught, noble men and women traverse the dangers of this untamed, yet beautiful, wilderness. They go. They hope to die that others might live. But their death is the way to life. As we learn from them, we’ll clothe ourselves with the virtues of peace. In no man’s land, these virtues are the tensions that help us navigate the war raging around us. The main tension, the one that informs all the others, is learning to balance grace and truth in order to avoid the temptations of bunkers. All our other responses emerge from this fundamental pairing. We must learn to speak with wisdom and tact, to act with both gentleness and strength, to allow our conviction to be seasoned with nuance, to be both innocent and shrewd, and to show both humility and courage. It may seem like a tall order, but as we follow Christ, he will show us the way forward. He’ll show us we’re not alone. If people see us, it may look like we’re only dodging, but we’re actually learning to dance. Does walking toward no man’s land, away from the figurative bunkers in our world, look more daunting or inviting to you? Do you think you’ve pursued a biblical principle at the expense of another? How so? When do you feel the uncertainty of not knowing which good thing/biblical principle to pursue? When have you felt attacked by opposing sides? Are you willing to begin exploring the biblical principles God has called you to pursue? Are you open to change? Want to learn more about getting out of your bunker and dancing in no man’s land? Read an excerpt here. 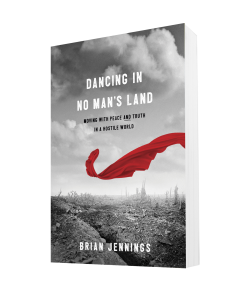 Or buy the book, Dancing in No Man’s Land: Moving with Peace and Truth in a Hostile World by Brian Jennings. Taken from Dancing in No Man’s Land: Moving with Peace and Truth in a Hostile World by Brian Jennings. Copyright © 2018. Used by permission of NavPress. All rights reserved. Represented by Tyndale House Publishers, Inc.
[i] The movie Warhorse depicts this well. [ii] I have listened to the sermon Hill preached at his wife’s funeral more than any other in my life. See: http://www.youtube.com/watch?v=T-WZyV6LMK0.